Biological Name: Swertia Chirata, Gentiana Chirayita/Ophelia Chirata (Gentianaceae) Its Sanskrit name kiratatikta, means "the bitter plant of the Kiratas", an outcast race of mountaineers in the north of India." It is also called Andryatikta of the bitter plant of the Non-Aryans. The Bhava-prakasa mentions a variety of Chirota/Chirata under the name of Naipala, that is produced in Nepal and describes it as a febrifuge. In every Bengali household, there is a regular habit of taking the water of overnight infused Chirota twigs (Swertia chirata) in the morning in empty stomach once or twice in a month to keep the digestion system clean and it also acts as a natural blood purifier. The Chirota has yellowish pith. It can easily be recognized by the hollow stem of the chirota plant. The infused water is extremely bitter and has no smell. An overdose causes a sense of oppression in the stomach. Directions: Put it in a glass of water. After 10 to 12 minutes take the chirota out and discard the water. This will cleanse the twigs and remove the dirt or anything else if present. 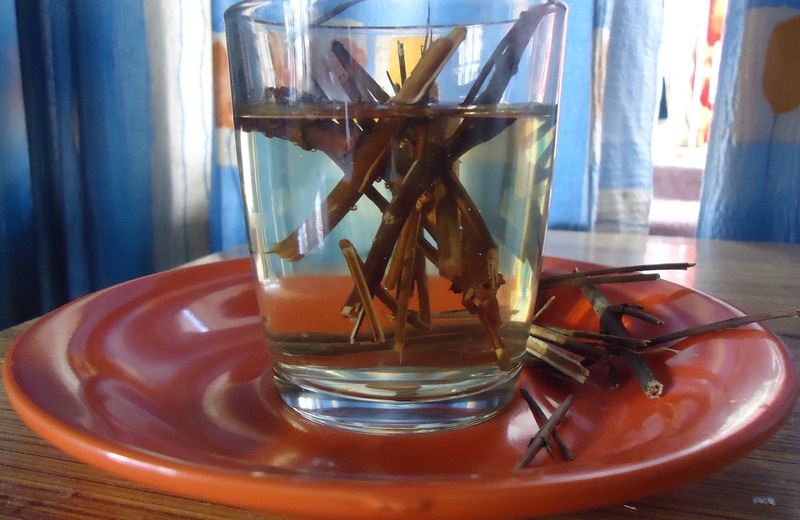 Now take a clean glass and put those washed twigs in it, fill the glass with drinking water and keep it overnight. In the morning the water will turn pale yellow. Take it while in empty stomach. My mother used to give us some salty breakfast and some sour fruits that day to soothe our taste buds. It was the regular cause of mental discoloration on almost every Sunday morning from our age of 5 to 15. Our parent's opinion was that for healthy skin and good digestion we must look after our health and hygiene as well as take healthy food ritually. The plant species Swertia chirata Ham. (F. Gentianaceae) is from a tropical family. Gentiana loves to grow in the mountains. In Europe official Gentiana came from the mountains of Switzerland, Tyrol, Burgundy and Auvergne. In India the species grows in temperate Himalayas from Kashmir to Bhutan and in Khasia hills of Meghalaya. The Chirota is indigenous to the mountainous regions of Northern India from Simla through Kumaon to the Morung district in South-Eastern Nepal. In India Chirota is regarded as a tonic. It is much used in the treatment of fevers of all sorts in a variety of forms and in combination with other medicines of its class and it would be good for the intermediate treatment of agues, an appetizer, and anathematic. It is used in alcoholic preparation as bitter flavoring agent. Chirota is used for treating intestinal worms, loss of appetite after fever, obesity, skin diseases, wounds, hepatitis, typhoid fever, vomiting in pregnancy as well as chronic and acute asthma. Chirota is febrifuge and laxative and is used for burning of the body etc. It is used for the treatment of cancer too. In Ayurveda as well as in the European tradition, exposure to a bitter flavor is said to give the digestive system strength and tone. Modern German research shows that bitter tonic herbal formulas (called bitters) may activate digestive substances, such as bile and hydrochloric acid, enabling us to digest our food more efficiently and effortlessly. Bitters have been shown to stimulate and heighten nervous system function, as well as the immune system, helping people recover more quickly from various chronic illnesses. The well-known English physician-botanist John Lindley considered all species of Gentiana as potentially useful in medicine. The Chinese or Indians are making household digestive tonics with these. It enters into the composition of numerous prescriptions for fever, diarrhoea, skin diseases, etc. It means, "take twigs of Chirota, tubers of Cyperus rotundus (mustaka), gulancha, parpata, and ginger, equal parts in all two tolas and prepare a decoction in the usual way." This preparation is much used in fever supposed to be caused by deranged air and bile that is remittent fever with gastric irritability and nervousness, etc. Kiratadi taila or oil of chirota: Take twigs of Chirota one seer, water sixteen seers, boil together till reduced to four. seers and strain. Boil this decoction of Chirota with four seers each of prepared mustard oil, The oil thus prepared is rubbed on the body for any itching. For dysentery: Take lime (Citrus auran tifolia) juice with hot water and little salt. The juice of black tulsi leaves (Ocimum sanctum) and Chirata (Swertia chirata) is also used for the purpose. Home remedies for worms: Paste of five lemon seeds (Citrus aurantifolia) mixed with water, take in empty stomach for a few days. A quick remedy for loss of hair due to unknown cause (except for chronic illness): One may use overnight infused Chirota water to wash hair for 3 to 4 days and use it every alternate day as well as can make hair oil with sesame oil and Chirota flower dust or paste, boil 25g of flower in 200g of oil, in case of dandruff should use coconut oil except of sesame oil. Chinese and Indian medicines as well as traditional European Medicines are very ancient, more than 4,000 years old. The Greek culture to the Sumarian and Egyptian cultures are nearly 5,000 years old. There are many common features between these three great medical systems even the use of some of the same herbs. Many herbalists and medical practitioners are taking elements from all references to help create the medicine of the future. It is one that is often found in Materia medicas both in Europe and the United States. Lewis, in his Experimental history of the Materia medica (1791), gives this formula. 1 ounce fresh lemon peel. 0.2 ounces dried orange peel. Simmer this mixture for an hour or two in three quarters of a pint of boiling water or infuse for an hour or two in three quarters of a pint of boiling water. It would make a very elegant bitter potion. The lemon peel is an excellent addition in the watery infusions. Tropical Africa used Chirota as against malaria (it is not an anti-periodic in the same sense with cinchona), reduces fever, leprosy, anti-dote for poison, intestinal problems, dislocation, anti-diabetic, fertility, and venereal diseases. Europe (since at least Medieval times) and America used it for appetite loss, fever, high blood pressure, kidney stones, diabetes, indigestion, worms, inflammation, snake-bite, poisoning, stomach ailments, and tonic. China used Chirota for digestive disorders. In Japan and China it is used for its bitterness instead of hops in brewing beer. In India, Bhutan, and Nepal (Holland, France, Germany, India, UK - listed in US Pharmacopoeia and part of ayurvedic medicine in India) used as tonic, appetite-improving. laxative, for cough, against worms, anemia, fever as well as gonorrhea.